Dennis is Managing Director of Development with a primary focus being the company’s newly launched multi-family division. His range of responsibilities includes development operations for office, retail and apartments, condominiums and mixed-use developments. Dennis Suarez has more than 30 years experience in development and design of multi-family residential spaces, which translates into the construction of 15,000 apartments and a number of mixed-use developments. His goal always is to maximize the client’s values, and he does that by truly understanding the investor and what the needs are for each project. 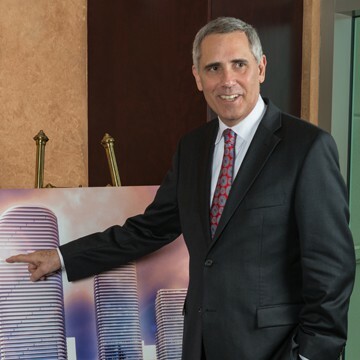 Prior to joining Allen Morris in 2013, Dennis Suarez was an executive with Archstone, JPI and Trammell Crow Residential, and was the Managing Director/Partner of York Residential, an Atlanta-based apartment development company with investments in Virginia, North Carolina, Georgia and Florida. Dennis Suarez earned a degree in architecture and a degree in building construction from the University of Florida. He is married and has two grown children. When not working, Dennis enjoys snow skiing, hiking and riding motorcycles.